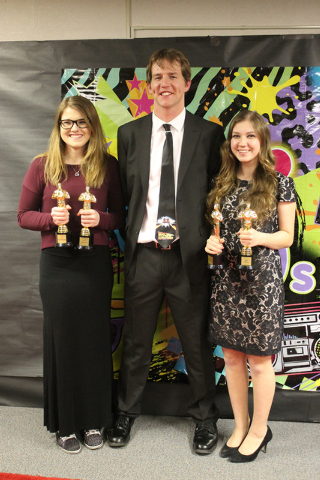 The third annual Boulder City Movie Awards featured an abundance of 1980’s movie memories as local high school students took home awards during the March 5 show held at the Boulder City High School theater. The show featured re-enactments from “Footloose,” “Top Gun,” “Back to the Future” and the “Indiana Jones” series. Awards were given out in 10 categories, including best film, best director, best actor and best actress. 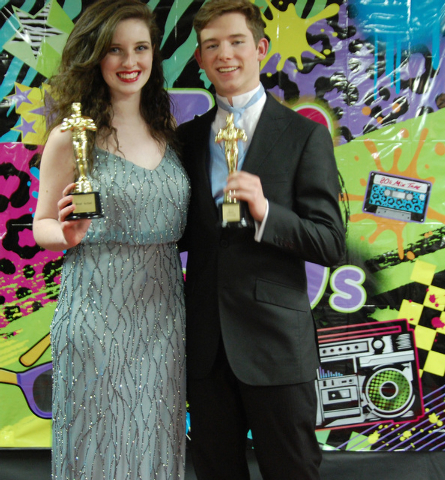 Senior Amanda Mraz, who co-hosted the show, took home two awards, including the award for best actress. Mraz said she had a severe cold about two days before the show but still wanted to host the event. Sophomore Audrey Palumbo, who won awards for best short film and best sound, said she was surprised when she found out that her film, “Kathy,” was selected as the best. “I really had no idea that our film would win. It was a great feeling knowing that my work was worth it and appreciated,” she said. “Kathy,” a short film about a group of girls traveling up to Mount Charleston where murders take place, won four awards during the evening. “I was happy with how our film turned out, but I really did not expect to win any awards, much less four. My film was a scary movie, and it was really relieving to find out that the judges and audiences viewed it as that,” Palumbo said. “Coulrophobia,” was the evening’s other big winner as it also took home four awards, including best actor and actress. It tells the story of a young man who is afraid of clowns and how he overcomes his fear. Mraz said she hopes the movie awards at Boulder City High will grow.